Chewing the rag is probably the oldest type of activity in ham radio. If you like to chat, you’re a ragchewer and are following in the footsteps of the mythical master ragchewer The Old Sock himself. 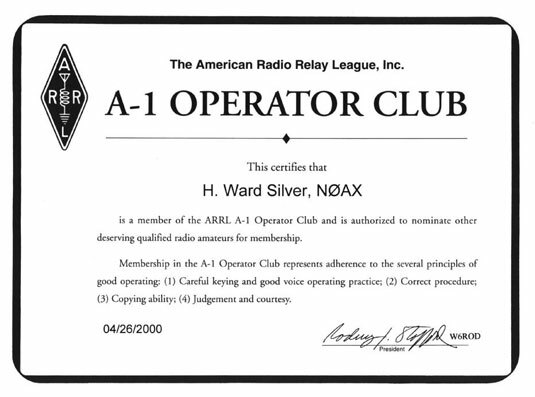 Ragchewing is an excellent way to build your operating skills, perhaps leading to an award such as the A-1 Operator’s Club Award. Start with your basic information: your call sign, signal report, operator name, and station location. Ragchews may be conducted between hams in the same town or a world apart. Most digital mode software encourages you to enter information about yourself and your station that’s stored as messages — called brag macros — that are sent by pressing a single key. After you exchange basic information, you may wander off in any direction. Hams talk about family members, other hobbies, work, propagation, technical topics, operating, you name it. Just about anything may be discussed. In general, hams avoid talking about politics or religious topics, and they don’t use profanity. Those restrictions still leave a lot to talk about, however, and hams seem to cover most of it. Wrap up the contact when you run out of things to talk about, when conditions change, or when maintaining contact gets difficult. Exchange call signs once more, and tune away. Nets (short for networks) meet at a regular time and on a consistent frequency. Each net has a theme — perhaps message handling (traffic), emergency-communications training, maritime or mobile service, or specific topics such as antique radios or technical Q&A. You can find nets for a specific topic or frequency online, such as on the ARRL Net Directory. If you’re a visitor, find out when you can check in. Nets often have specific times when visitor stations can participate. Similar to nets are roundtables, in which a group of hams on one frequency share information informally. Each ham transmits in turn, and everyone gets a chance to transmit in sequence. Some roundtables have moderators. Many hams like to participate in radio contests, such as competitions in which they exchange call signs and short messages as quickly as possible. Similar to short-term contests is chasing DX or DXing — pursuing contacts with distant stations. Keep contest contacts short. In a contest, the object generally is to make the largest number of contacts, so dilly-dallying around isn’t desirable. Pass along just the minimum amount of information, called the exchange. Then sign off in search of more contacts. While you’re DXing, keep contacts with rare stations short if many stations are calling; exchange just call signs and signal reports. Keeping contacts short allows other hams to make those sought-after contacts too. DX contacts tend to be short because the distances are great and maintaining contact is difficult. Ragchews with DX stations are encouraged only if conditions support good signals in both directions. Try to judge conditions, and tailor your contact appropriately. If you encounter stations making contest QSOs, listen until you figure out what information is being exchanged before participating. By far the most common types of information exchanged are signal reports, locations (often expressed as a numbered zone or section defined by the contest sponsor), and serial numbers. Serial numbers are assigned for each contact made in the contest. If you’re making your fifth QSO in a contest, for example, your serial number is 5. If the rate of making contacts is relatively relaxed, contesters are happy to explain what information they need. Usually, you can find the complete rules for contests in online contest calendars such as Hornucopia and ARRL, which includes QST magazine’s Contest Corral, or on the sponsor’s website. If contestants are making contacts lickety-split, you may want to wait, or figure out what they need on your own and then make a quick contact. Remember that not everyone speaks English. Most hams who don’t speak English still know enough words of English to communicate a name, location, and signal report. Otherwise, an international set of Q-signals (see the nearby sidebar) allows you to exchange a lot of useful information with people who speak a different language. DXing is a great way to exercise that rusty high-school Spanish or German.